When Eric Harris and Dylan Klebold murdered 12 students and one teacher at Columbine High School on April 20, 1999, the media and parents quickly called attention to the boys obsession with the film Natural Born Killers (1994). As they were planning the attack, the boys gave it the code name “NBK” and they had memorized the film’s dialogue verbatim. It was also noted that the boys had seen The Basketball Diaries (1995), which includes a fantasy sequence where Leonardo DiCaprio (wearing a black trench coat) shoots his classmates with a shotgun. Other factors were also explored, including the boys’ taste in music and the social climate in Colorado, and quickly the debate over the influence of violent media erupted. It wasn’t a new debate by any means. I vividly remember the whirlwind of controversy surrounding the first Mortal Kombat video game upon its release in 1992. Kids in middle schools across the country were trading the infamous “blood code” (that unlocked the game’s graphic mode) like it was currency. Violence in film and its influence has been analyzed since a gun was fired directly at the camera in The Great Train Robbery in 1903. The gangster pictures during the pre-code era of the 1930s then left behind stacks of corpses to be stepped on by the amoral anti-heroes of the violent film noir era. Violence, in one form or another, has always been on screen and always been debated. In 1955 Blackboard Jungle surged onto screens. The drama about one stalwart teacher determined to positively influence the lives of violent inner-city students caused theater riots in England and the U.S. The well-known Bill Haley and His Comets’ song “Rock Around the Clock” opens the film and in many cities the song had to be removed because it sent teenage audience members into a frenzy. In other areas, the film was outright banned. It’s reflection of teenage disillusionment and anger tapped into something deep within the America’s youth, who were far more interested in the film’s music and fashion than any of Glenn Ford’s sermons. The literature regarding school violence in film is lamentably skim. Contemporary film criticism is brimming with texts on nearly every subject other than this flagrantly relevant one. The debate and assumptions over whether violence in film influences people to commit their own acts of violence ceaselessly rages on, while any meaningful examination of the subject of the depiction of school violence in film remains absent. The reasons may relate to the sensitivity of the subject, but I believe that it’s because films about school violence visualize tragedy in a manner that attempts to make the incomprehensible comprehensible, which many folks don’t want to comprehend. As parents, politicians, and artists debate whether fictional violence breeds the real thing, it has been overlooked (or ignored) that real-life tragedies brought about a paradigm shift in the way films about school violence focused their narratives. The Columbine High Massacre was the strongest catalyst for this shift. Until then school violence in films tended to revolve around juvenile delinquency, race, and frictional socioeconomic factors. For decades a diverse range of films depicted various manners of school violence – some cautionary, some pure entertainment – and tried to explain its origins. Following the tragic event in April 1999, films concerned with school violence took a dramatic turn. The catalyst for violence nearly unanimously became bullying, as well as depression and psychopathy, to a degree. Many films took an empathetic look at school shootings, their victims, the shooters, and their aftermath, while others simply exploited tragedy to sell their movie (well, really only one film took this despicable path). The first section of this study, will briefly look at Blackboard Jungle (1955), a seminal film about school violence and juvenile delinquency. In the wake of Blackboard Jungle, a stream of similar films arose that contain many thematic consistencies, including unorthodox teaching methods, unsupportive spouses, and apathetic faculty. I’ll be referring to this as the “inner city teacher” genre. This narrative formula can be found in varying degrees in films such as Up the Down Staircase (1967), Hard Lessons (1986), and Dangerous Minds (1995). It will be noted that in most cases of the juvenile delinquent genre, the films are based on true stories. The book will then be divided into two sections: Pre-Columbine and Post-Columbine. 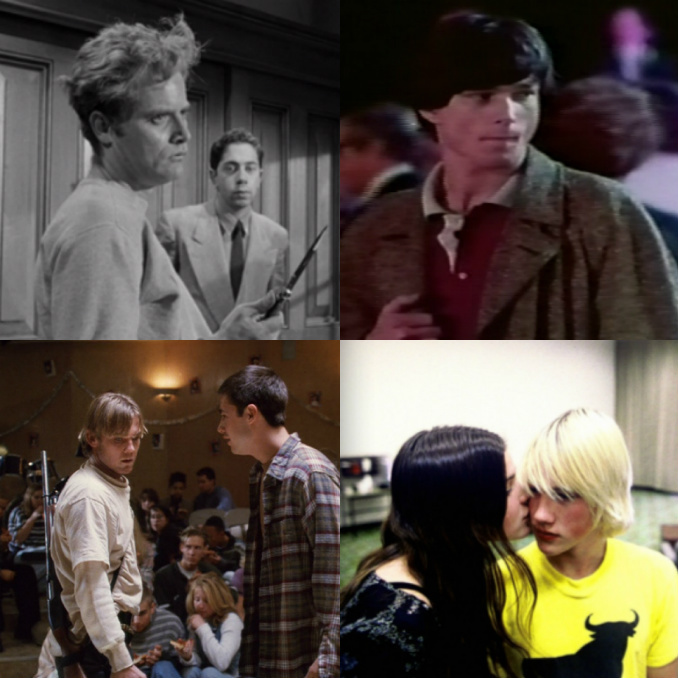 Films produced before the tragic events of 1999 were sometimes influenced by previous acts of school violence, such as A Friend to Die For (1994) and Detention: The Siege at Johnson High, aka Hostage High (1997), which was based on the Lindhurst High School shooting that occurred on May 1, 1992. Although the film Bang Bang You’re Dead (2002) was released after the Columbine tragedy, it will be covered in this section since it is based on a play of the same name written prior to the event, in the wake of three school shootings that occurred in 1997 and 1998. 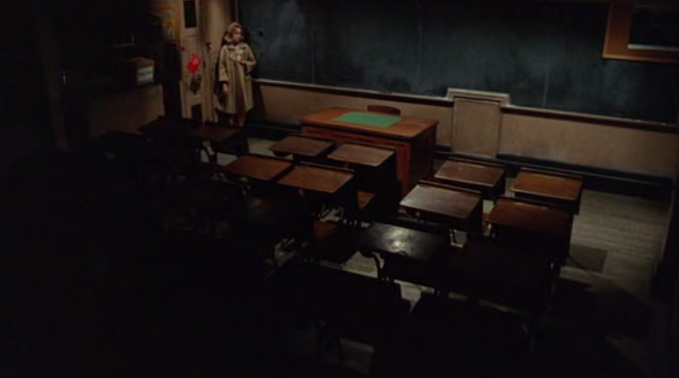 Other films produced Pre-Columbine were pure exploitation, like Renee Dalder’s attack on the upper class in Massacre at Central High (1976). A similar motif was explored a decade later with much more style and grace in Michael Lehmann’s black comedy Heathers (1987). Because of its alleged connection to the Columbine tragedy, this section will also look at The Basketball Diaries. The Post-Columbine portion of the book will be the bulkiest. It will look at films such as 2003’s Elephant and Zero Day that realistically reflected the tragedy without offering any simple answers. Others, including Uwe Boll’s uncharacteristic melodrama Heart of America (2002), presented the filmmakers’ point of view on what forces drive a kid to kill. No matter what the filmmaker’s intention, the large majority of these films explore the events leading up to their violence and the emotional aftermath on the students, parents, and community. One remarkably horrid film, Duck! The Carbine High Massacre (2000) attempted to capitalize on the Columbine tragedy with a loathsomely satirical reenactment. Despite its callousness, Duck! must be included in the discussion as it’s the first film to directly address the Columbine tragedy. The aim of this study isn’t to establish a link between film violence and its possible effects in the real world. I have my own opinions regarding this argument but won’t be using this study as a platform. My interest is in assessing the way school violence has been depicted in films since 1955’s Blackboard Jungle and considering these work’s thematic consistencies. By looking at the cohesiveness of it as a category of film, I hope to create a resource and to open the floor for further study.